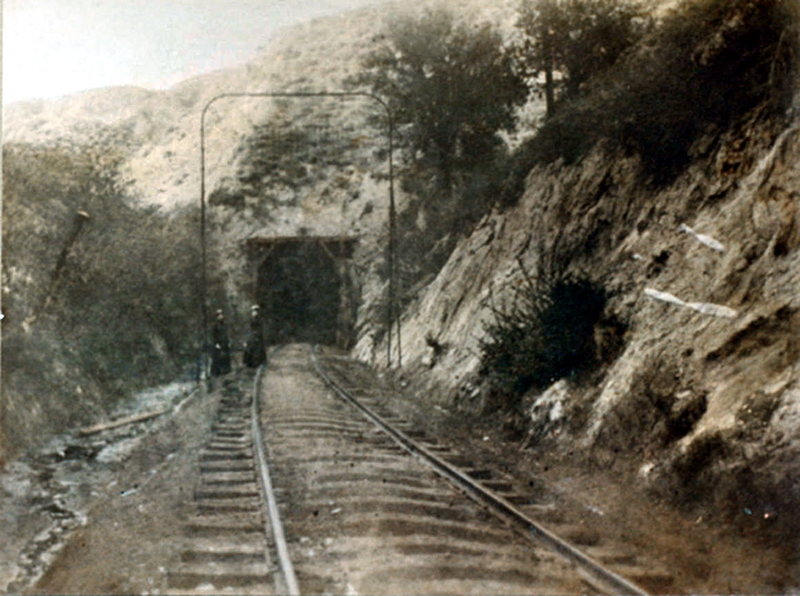 SCVHistory.com OV1001 | Newhall | Entrance to the San Fernando Train Tunnel, 1910. Two people stand near the (south?) entrance to the San Fernando Tunnel in 1910. A thousand Chinese rail workers spent the better part of a year — and an unknown number gave up their lives — digging the San Fernando Railroad Tunnel. At 6,940 feet, it was the third longest tunnel in the United States when it was completed July 14, 1876. (The tracks went in and the first engine poked its head through in August.) The tunnel, along the Southern Pacific Railroad's San Joaquin Line, linked the San Fernando Valley (at the Newhall Pass) with the Santa Clarita Valley (in Railroad Canyon), facilitating the conjoinder in September 1876 of northern California with Southern California at Lang in present-day Canyon Country. OV1001: 19200 dpi jpeg from smaller jpeg of 6x8-inch print | San Fernando Valley Historical Society Collection at California State University, Northridge. Online image only.